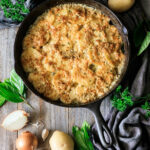 Asiago scalloped potatoes is an easy, cheesy side dish recipe you can be proud to serve your family for a holiday dinner or brunch. This homemade classic starts off on the stove top and is finished in the oven thanks to an old fashioned cast iron skillet. Made with heavy cream, onions and garlic this recipe tastes wonderful with ham. It’s simple, traditional and is best served hot for a truly unforgettable side dish. Melt 2 tablespoons of butter in a large cast iron skillet over medium high heat. Add the chopped onion and saute until soft, roughly 5 minutes. Add the minced garlic and cook until fragrant, stirring continuously. Sprinkle on the salt, sage, nutmeg and black pepper, and cook for one minute, stirring continuously. Transfer the onion mixture to a large bowl. Grate the Asiago and Romano cheese and mix them together in a bowl. Wash and peel the potatoes, then cut them in 1/8 inch slices with a mandolin, box grater, or food processor. Submerge the sliced potatoes in a large bowl of water to keep them from turning color. Drain the potatoes and dump them into the large bowl with the onion mixture. Mix well with your hands. Melt two tablespoons of butter in a large cast iron skillet over medium high heat. Remove from the heat and carefully layer the potato slices into the skillet. Pour the heavy cream and chicken broth into the skillet, then add one bay leaf. Cover with a large lid. Bring to a boil over medium high heat, then reduce heat to medium low and simmer for 10 minutes. Take off the lid and sprinkle on the cheese. Put the skillet in the oven and cook for 20 to 23 minutes or until the cheese is golden brown on top. Sprinkle on the fresh thyme leaves and let the scalloped potatoes cool for 10 minutes on a wire rack before serving. This allows the dish to finish setting. Carefully remove the bay leaf from the center. This dish keeps warm for up to an hour in the cast iron skillet. The pleasure of a 5 star review for this asiago scalloped potato recipe would be greatly appreciated.